Is the first season of the Pretty Little Liars: The Perfectionists TV show on Freeform free of flaws? As we all know, the Nielsen ratings typically play a big role in determining whether a TV show like Pretty Little Liars: The Perfectionists is cancelled or renewed for season two. Unfortunately, most of us do not live in Nielsen households. Because many viewers feel frustration when their viewing habits and opinions aren’t considered, we’d like to offer you the chance to rate all of the Pretty Little Liars: The Perfectionists season one episodes here. A Freeform mystery drama, Pretty Little Liars: The Perfectionists stars Sasha Pieterse, Janel Parrish, Sofia Carson, Sydney Park, Eli Brown, Kelly Rutherford, Hayley Erin, Graeme Thomas King, Chris Mason, Noah Gray-Cabey, and Evan Bittencourt. 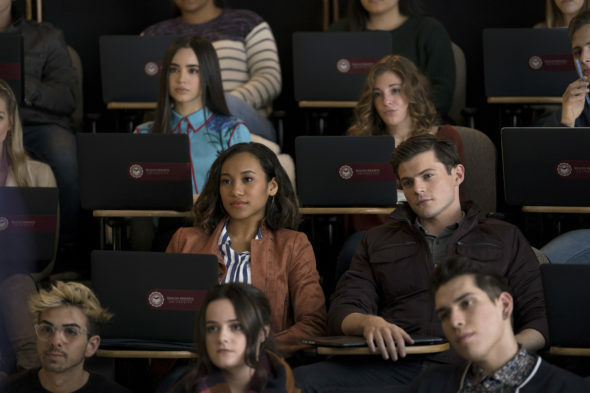 The crime thriller unfolds at Beacon Heights University and the surrounding town, and centers on three over-achieving students, friends Ava (Carson), Caitlin (Park), and Dylan (Brown) — known as the Perfectionists. After the first ever murder in Beacon Heights, although they work together to solve the mystery, each Perfectionist hides behind “a secret, a lie, and an alibi”. What do you think? Which season one episodes of the Pretty Little Liars: The Perfectionists TV series do you rate as wonderful, terrible, or somewhere between? Should Freeform cancel or renew Pretty Little Liars: The Perfectionists for a second season? Don’t forget to vote, and share your thoughts, below. More about: Pretty Little Liars: The Perfectionists, Pretty Little Liars: The Perfectionists: canceled or renewed? Awesome show! Please renew it. I honestly don’t even want to invest the time in viewing season one unless I know there will at least be a season two.